Bomb damage contributed significantly to the formation of Burgess Park. In 1917, a Zeppelin raid destroyed 3 houses, killing 12 people. During World War 2 the area was again damaged by bombers, and later the infamous V1 ‘doodle-bugs’ and deadly V2 rockets. 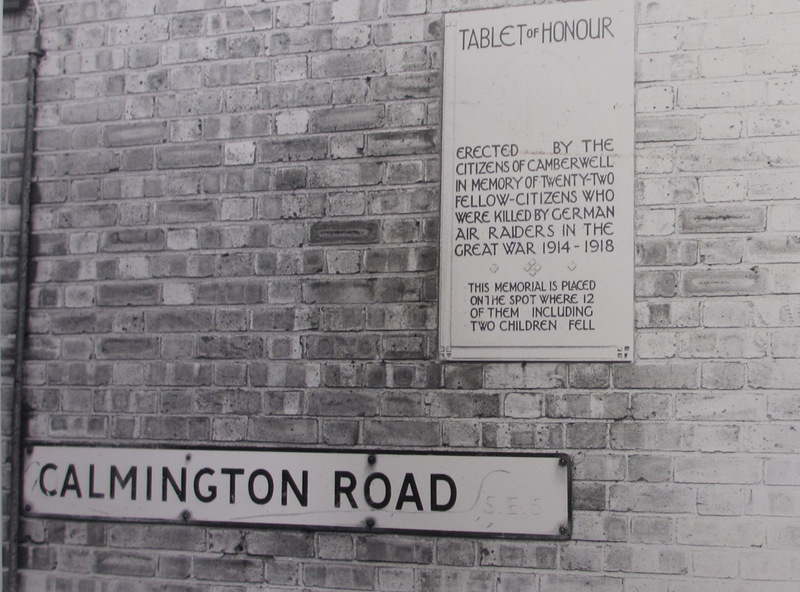 Local people were given temporary pre-fabricated housing – known as ‘prefabs’. During World War One (1914-1918), for the first time airborne bombing was used extensively by both sides. Initially the German leader, Kaiser Wilhelm II, forbade London as a bombing target lest his close relatives, the Royal family were affected. The Kaiser’s protective policy towards London changed in May 1915 following British raids over Germany. The Germans used enormous airships, the legendary Zeppelins, to drop bombs over England. This 1915 recruitment poster (below) uses fear of Zeppelin raids to generate a patriotic response. 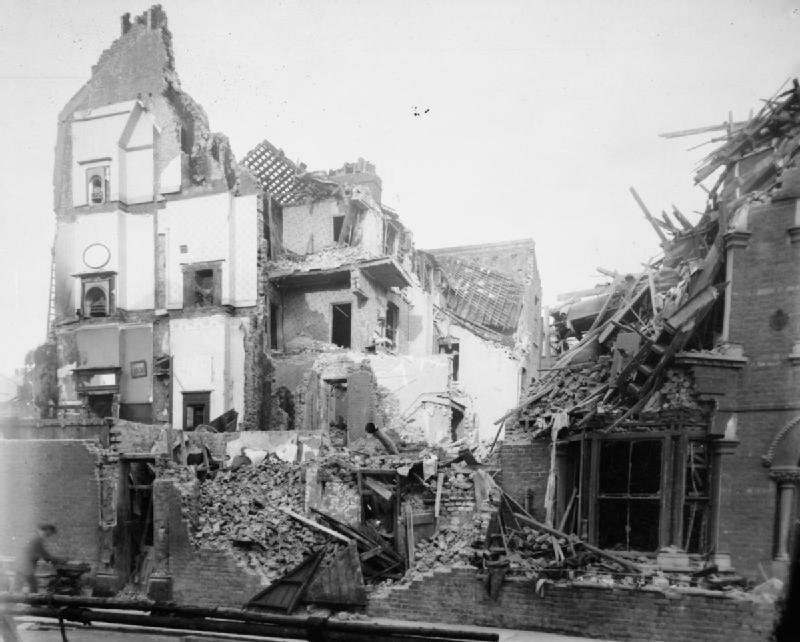 On the night of 19th October 1917, Navy Zeppelin L45 dropped a 300kg bomb which destroyed a row containing three houses, a fish and chip shop and a doctor’s surgery, killing 10 people and injuring a further 24. The loss is even more tragic as we know now that devastation was entirely incidental; L45’s intended target was industrial Sheffield, but southerly winds blew the airship wildly off course. L45 had already bombed Hendon, Piccadilly Circus and went on to Hither Green. The L45 Zeppelin measured 196.3m in length (almost two football pitches end to end). For the Germans, the raid was a disaster. On return, the L45’s crew force landed in the French Alps and surrendered. The ship itself was destroyed in the process. The raid was the last large scale Zeppelin raid. See pictures of the the L45 Zeppelin and its captured crew here. 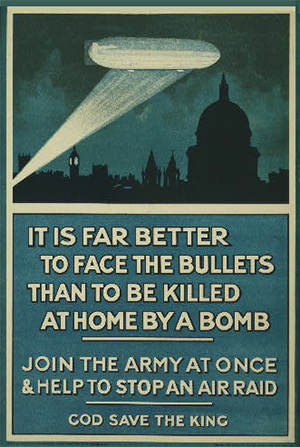 In total, World War 1 air raids over the UK caused 1,413 deaths and 3,409 injuries. Psychologically the damage ran far deeper – for the first time, civilians were also in danger – not just front line soldiers. The bombing of London during World War 2 (1939-1945) fell into two phases; firstly the infamous Blitz (German for “flash of lightning”) September 1940-May 1941. Huge swathes of the industrial London such as Docklands, including the nearby Surrey Docks, simply went up in flames under the onslaught of incendiary bombs. The Luftwaffe (German air force) used the Thames to navigate and it’s likely that canals, such as the Surrey Canal, served likewise. After June 1944, a second phase of bombing began with something new: unpiloted devices; firstly the V1 flying bombs (aka “doodle-bugs” – which made a distinctive buzzing sound in flight) and from September 1944, the first ever long range ballistic missiles, the V2. Defence was almost impossible: the V2 travelled at 3000 mph plus and could achieve an altitude 50 miles or more, from mobile sites in occupied France and Holland. Whereas the Blitz raids usually caused fires, the V1 and V2s created blasts upon impact, a far more deadly and destructive force. 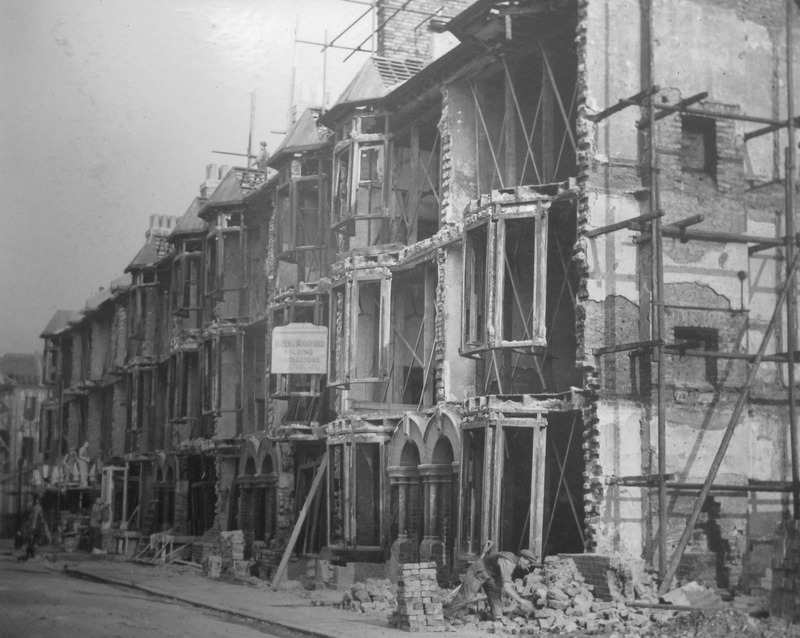 One of the worst single episodes was the total destruction of Cunard Street (which was to the west of Chumleigh Gardens, by Wells Way) on 10th May 1941. The Watkins Bible Factory was also considered beyond repair. The centre of what we now know as the Park (the open playing field) was particularly badly hit. 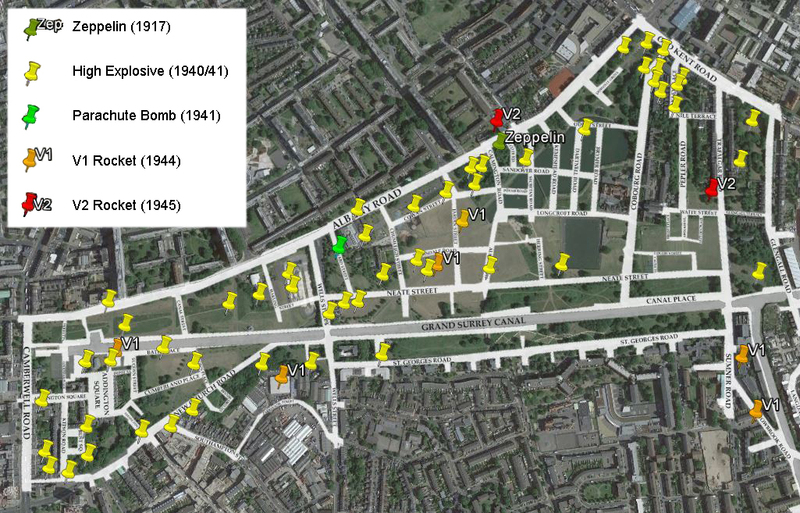 See here for the full extent of WW2 bombing in the Burgess Park area. By the end of the war, some 100,000 families had lost their homes in London (Roy Porter p428). Even before the war was over, in 1944 an Act of parliament granted local authorities the compulsory right to purchase bombed areas. Alongside this, a vast master plan for a new London by Patrick Abercrombie highlighted the need for green space in this part of Southwark. Bomb damage from WW2 had a hand in the eventual birth of Burgess Park and also the high rise buildings we see today in the Aylesbury estate. As Lord Birkett (former Director of Recreation and Arts, GLC) said looking back to this era of destruction, “When all this is over, we’ll make this a better place to live in. We’ll give some greenery to people who haven’t got any, [to] make up for what they’ve been through”. Listen to people’s memories of bombed buildings here. 2 of my brothers were killed in the raid on Albany Road in 1917. Their names are on the plaque in what was Calmington Road. We’ve had a name change. It was Balls. It seems a film exists of that raid. Do you know where it is ? There was a 1/4 mile procession afterwards. Have you details in your archive? P. Boyce. Fascinating information, thanks for sharing it. Unfortunately, we’ve not heard of the film. The IWM – War Museum – in Kennington would be a good place to look for a copy of the film – they certainly have photos, one of which we’ve used here. The Southwark Local History Library in Borough High St should have information of the commemoration procession, very likely. I’ll try and get there to look it up. Watch this space! Would there be any chance you could please come in and speak with my class? I would very much appreciate it. Has anyone any information on Alfred Fowler or Able Seaman Glass? The worst single episode as you describe it, of Cunard St, was where my father lived. He was in the house at 18, Cunard St when the Land Mine went off. His father, mother, brother and sister all died in the house and he was buried by the rubble and was recovered from the remains of the house sometime later. His other brother had been evacuated to Somerset. His father who died worked at the R.Whites factory that was also hit and there was a suggestion that he actually wasn’t in the house at the time but was in the factory that had been hit by incendiaries and died trying to save the lorries in the factory. Used to play on the bombsite next door. My Grandparents, Edward and Ellen Gould lived at 25 Calmington Road. My Grandma was born there in 1895 and her parents Francis and Mary Ann Smith moved there around 1890 from 28 Neate Street. Francis was the maintenance man for several of the houses in Calmington rd and acted as agent for the landlord. My mum Margaret and her brother Derek grew up there during WW2. I remember them telling me stories of the doodlebugs and hiding under the kitchen table during the raids. My Uncle used to play on the bomb sites and collect shrapnel. During childhood visits in the 70s I remember seeing bomb damage cracks that had never been repaired. Watching the horse drawn rag and bone carts was a regular treat too, although the outside loo was not! They retained the coal range in the kitchen as only source of cooking and ironing and gas lighting throughout their part of the house, right up until the houses were eventually pulled down. Hi Deborah. I lived at 3 Longcroft Road, around the corner. Jennifer Somers had a brother David. My friend at school Lorna Gould’s grandparents lived in Calmington Road. Lorna lived in Ilderton. Went to Trinity House. My wife and I lived in a flat at 1 Calmington Road in 1978. We lived there for about a year. The flat was very haunted. Several ghosts would pass through the place. It was not a good experience. The Flat was a couple of yards away from the commemorative plaque. The building next to us had been bombed by a Zeppelin. Happy memories though.